As I reflect on our 50th class reunion during the recent Alumni Reunion Weekend, it really struck me how connecting in person is just so much better than seeing a Facebook update or reading an email. We are so lucky to have gone to a school like Redlands, and being together and remembering what a beautiful place it is was very special. When I first emailed my classmate Nancy Bailey Franich, who had done so much for the 10th, 20th, and 25th reunion festivities I had attended, to verify the upcoming 50th reunion dates, I also extended an offer to help on the Reunion Committee. I didn’t realize how involved I was going to be over the next year! Our planning committee of 16 reached out to classmates to encourage their attendance and participated in monthly conference calls with University staff. In addition, I volunteered to create a memory book. While it took hours and hours to compile, it was interesting to learn what my fellow classmates had been doing since graduation, where they had lived, and their favorite Redlands memories. I could still vividly picture some of these Bulldogs as I read their submissions! The Class of 1968 reunion events, starting with Friday night’s warm-up event at the Alumni House, drew 100 alumni and guests. At the Saturday luncheon, Chris Lampe ’68 did a great job as emcee and invited all attendees to share reflections as part of the program. President Ralph Kuncl came to welcome us as well. It was definitely the highlight of my weekend because it gave me the most opportunities to connect and catch up with my classmates, including my freshman-year roommate from Fairmont Hall. It was so fun to mingle—I lived in Redlands from third to seventh grade before coming back to attend the University, so I recognized some attendees from my childhood. I even had a great time talking to classmates that I didn’t know as well when we were students—everyone was friendly and united in this special weekend. Regrettably, I was not able to attend the historical tour led by Larry Burgess ’67, but I heard from many who did that it was a wonderful glimpse into the campus’s past. I was, however, honored to be invited to the Volunteer and Philanthropic Leadership Reception as a Reunion Committee volunteer and President’s Circle donor. Then, we were off to dinner on the Gallery Lawn. What a picturesque setting among the lights, with the Administration Building and Redlands topiary in view. The entertainment from the Chapel Singers was spectacular, and I loved seeing the other classes also in reunion. 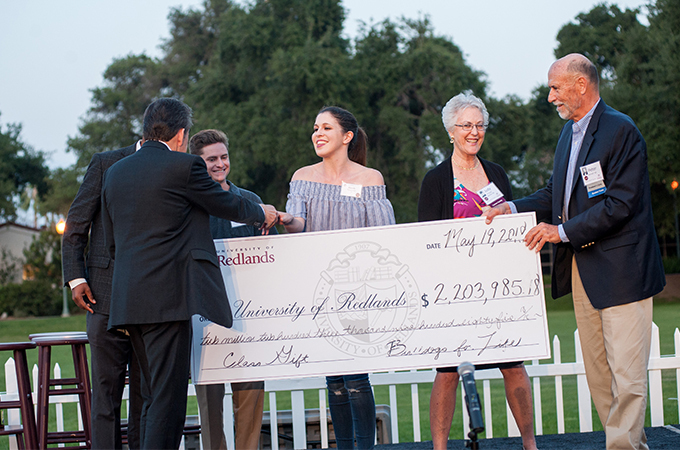 During dinner, Judy Provost Bonilla and Peter Konrad represented our 1968 class gift—nearly $1.3 million—and I was so proud that the entire weekend raised more than $2.2 million for the University as part of the Forever Yours campaign. When a milestone like this comes around, you get more nostalgic and more appreciative of the great education we received here. We spent four years together in a special place where our teachers really knew us and where we interacted in classes and around campus, and we want that for future generations, too. We ended our memorable weekend with brunch at the president’s home, where we were personally greeted by First Lady Nancy Kuncl and enjoyed our last event together in such a lovely setting. I had the opportunity to reconnect with six sorority sisters from Alpha Sigma Pi, and we will try to get together again before the next reunion. My friends who attended larger universities are blown away that I could attend a class reunion and actually know people. It was so comfortable being with everyone, so fun to talk to people, and so surprising that some still looked the same as they did in school where I would recognize them anywhere! Just being together on campus made it feel like the years melted away, and I really cherished the experience. To see photos from the 2018 Alumni Reunion Weekend, visit http://bit.ly/URreunion2018. 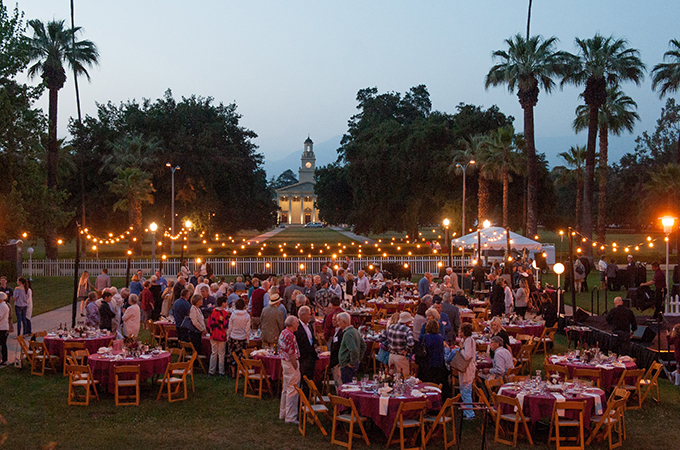 To volunteer for your class reunion, contact the Office of Alumni and Community Relations at 909-748-8011 or email alumni@redlands.edu.